"Oh, pooh! boating!" interrupted the Toad, in great disgust. "Silly boyish amusement. I've given that up long ago. Sheer waste of time, that's what it is. It makes me downright sorry to see you fellows, who ought to know better, spending all your energies in that aimless manner. No, I've discovered the real thing, the only genuine occupation for a lifetime. I propose to devote the remainder of mine to it, and can only regret the wasted years that lie behind me, squandered in trivialities. Come with me, dear Ratty, and your amiable friend also, if he will be so very good, just as far as the stable-yard and you shall see what you shall see!" […] and there, drawn out of the coach-house into the open, they saw a gypsy caravan, shining with newness, painted a canary yellow picked out with green and red wheels. "There you are!" cried the Toad, straddling and expanding himself. "There's real life for you, embodied in that little cart. The open road, the dusty highway, the heath, the common, the hedgerows, the rolling downs! Camps, villages, towns, cities! Here today, up and off to somewhere else tomorrow! Travel, change, interest, excitement! The whole world before you, and a horizon that's always changing! 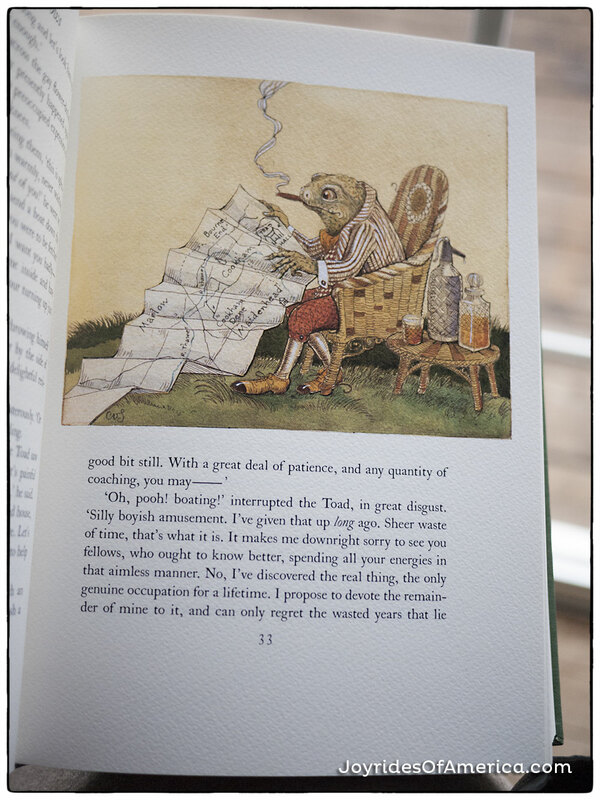 …"
The Wind in the Willows by Kenneth Grahame, illustrations by Charles van Sandwyk, published by the Folio Society. Good ol' Mr. Toad! I couldn't agree with you more….except, I still like boats too.